Nancy Sinatra’s “These Boots are Made For Walkin’” was a ’60s sensation. (If by some inexplicable misfortune you’ve never seen the video, stop everything and check out this amazing artifact of era-capturing grooviness right now.) The song was destined for glory: Everything about it was hip, from Wrecking Crew member Chuck Berghofer’s opening bass line, to Sinatra’s tough, eat-my-dust delivery, to the iconic cover featuring the singer in red leather boots and a fetching miniskirt. If you didn’t own a pair of go-go boots before the song was released, you rushed out to buy a pair soon after. Sinatra showed the world that a woman could have serious swagger, and the Technicolor beauties dancing the Frug in the background were all too ready to follow in her footsteps—as was a whole generation of independent women. The song soon skyrocketed to number one and was later nominated for three Grammys. This week, in honor of the 50th anniversary of the release of “These Boots Are Made for Walkin,’” I fulfilled a lifelong dream of talking to Nancy Sinatra about this most memorable of pop hits. 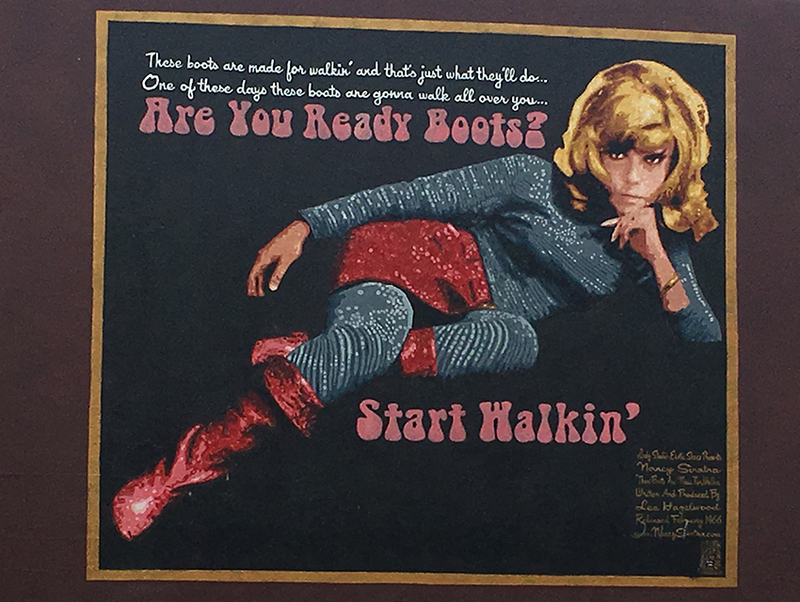 Tomorrow it will be 50 years since “These Boots Are Made For Walkin’” first made the Billboard charts. Did you have any idea at the time of the lasting impact it would have? I knew it was a hit the first time [writer-producer] Lee Hazlewood played the bass line on his guitar in my mother’s living room. When I heard the track in the studio, I knew then and there it would be a number-one record. I even told Lee to release the track without the vocal! The fact that it has been embraced by generation after generation of little girls is proof of its staying power. I was the lucky one to record it and I think the fashion helped it along. Girls always want a pair of boots. How did this song come into being? What’s the backstory? Do you remember where you were when you first heard it on the radio? I was in my car and I pulled over to the side of the road to listen. Who had the foresight to film a video, years before the existence of MTV? It wasn’t a video per se, but a Color-Sonics film that played on Scopitone jukeboxes. The other videos and performances out there are from TV shows like Ed Sullivan, Hullaballoo, and Shindig. Where was the video filmed and did you know those go-go dancers? It may have been shot at Goldwyn Studios. I have no idea about the dancers, and no specific recollections about the filming except that I was nervous about “The Shadow of Your Smile,” which was filmed the same day. The director was the great choreographer Robert Sidney. Whatever happened to the boots you wore on the album cover? I lost track of them. I donated them to a club, I think. I didn’t appreciate the value of memorabilia in those days! Alison Martino is a writer, television producer and personality, and L.A. pop culture historian. She founded the Facebook page Vintage Los Angeles in 2010. In addition to CityThink and VLA, Martino muses on L.A’s. past and present on Twitter and Instagram.